Lectronix has offered a wide range of products to meet customers specific mobile needs. The T8065 offers a comprehensive information processing and display system for heavy vehicles. The user operates the system through a 6.5″ color display and touch screen that is specifically designed for clean installation in truck dashboards. With direct connection to the vehicle’s J1939 bus and an array of optional enhancements focused on navigation, truck data, and communications, the driver is provided with Total Information Awareness of his vehicle and operating environment. 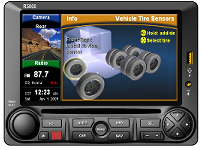 The T7000 2D5 combines radio, CD player, iPod Docking, Satellite radio, Camera system, tire pressure monitoring (TPMS), integrated NAV/GPS, Bluetooth handsfree, Qualcomm OmniVision interface and advanced engine, truck, and trip monitors into a single integrated system designed specifically for use in Tractor Trailer Vehicles. The unit installs easily in the same dashboard space commonly used for existing radios. The T7000 2D5 also allows for trailer tire pressure monitoring as an option to be accessed from one common interface. The R5000HT combines navigation, tire pressure monitoring, rear-view camera system, advanced engine and trip monitors, broadcast and Sirius satellite radio, and CD/MP3 player into a single integrated system designed specifically for use in Heavy Trucks. The Navion R5000 combines radio, CD/MP3 player, rear-view camera system, and advanced engine, coach, and trip monitors into a single integrated system designed specifically for use in Recreational Vehicles. The unit installs easily in the same dashboard space commonly used for existing camera monitors, and replaces three separate systems (camera, radio, and vehicle computer) with one. The Navion R5000 also allows navigation and tire pressure monitoring as options to be accessed from one common interface.